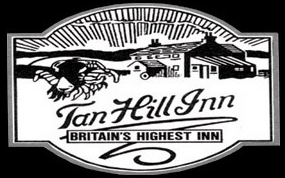 Hi again to our friends of Tan Hill and welcome to our 2nd Newsletter. We have enjoyed another record breaking October with events like the Rugby World Cup that we were very proud to host in our established indoor beer garden,made more comfortable, now that it has a lovely large coal fire that exudes warmth and a fantastic ambience. Now we can cater for more people creating lots of new events allowing us to look after everybody’s needs and imagination. Hen do’s, staff parties, reunions, Christmas parties, in fact anything you want to celebrate..... Talk to us! We can’t believe it is the final- with New Zealand v Australia tonight and such a shame that England did not make it through to this stage. I am sure we will have a few groups coming along to watch the final, why not watch the final at Britain’s highest? Spooky - Saturday 31st October 2015........ we had a great Halloween last night , the scene was set as it was foggier than usual, what a place to party “lonely and isolated” on top of the hill, you can’t get a spookier place to celebrate Halloween that is if you dare,....... if you didn't make it this year you should book it for next year as places fill up fast. There are lots of stories about ghosts and then there is the American Wear Wolf lurking around on the moor, especially when the full moon is out. Maybe we will have a daring candle lit walk depending on the weather at midnight .... " Remember to Stick to the path! " who knows whats out there! We are celebrating Bonfire night, with fireworks, outdoor bonfire and a special menu with roasting Jacket potatoes, chilli con carne homemade winter soup and our own Tan Hill home -made Yorkshire Parkin, which it is to die for. We are also having a competition for the best guy falks, so come along and enjoy the highest bonfire in Britain at 1732 ft, you may even win the top prize so be in it to win it so bring Grand dads best jacket along and dress the guy in a flat cap? We are sure you will have lots of great ideas. There will also be prizes for runners up. The outdoor bonfire and fireworks are Weather permitting (high winds and torrential rain) if the weather is bad we will stay by the cosy open fires and enjoy the ambiance of the rustic indoors instead. We have unfortunately just had a stag do cancelled so there are still rooms left. So don’t miss out book now .... You can check on our new electronic availability diary on the web site or simply give us a call. There are great deals to me done at this time. We must not forget Remembrance Day, we would like to celebrate with you and certainly give a discount to veterans families of £10.00 for two course Sunday lunch. We will also be holding a special draw to win a prize to stay here over night. So bring your parents along to celebrate with us, or tell someone who has not managed to get to Tan Hill yet or not on our subscribers list. with us at Tan Hill on launching his new book Pigs Might Fly- Free Admission. A former owner of the Tan Hill Inn is returning to the inn… but only for one night. Neil Hanson managed the famous inn – Britain’s highest at 1732 feet above sea level – in the 1970s and owned it in the mid-1980s, before taking up a career as a professional writer. Now the author of over fifty published books and an award-winning after-dinner speaker, Neil’s page-turning, laugh-a-minute style has earned him comparisons with James Herriot and Gervase Phinn. And he has been invited back by us Viv and Steve Bailey, to tell some “Tall Tales From Tan Hill”, taken from his latest book Pigs Might Fly, about that far-off era at the inn. Neil will also be showing the iconic 1985 Everest double-glazing advert, featuring Ted Moult, and telling the hilarious tale of how it came to be made. A recent Channel 4 poll voted it one of the 50 most popular adverts of all time. We still have rooms available if you want to do something different and make the night of it, so definitely book now. She loved Tan Hill and its surroundings and didn’t even mind the windy road to it she said it was worth it for the scenic routes. That’s the sort of character we love at Tan Hill and made our Inn so unique. It’s always about the people. We try never to forget that. That takes us to the end of November and bring us into the festive season, so keep an eye on our website www.tanhillinn.com for forthcoming events and don’t forget to book your Christmas staff/ family party here. Where could be better?